We were all very saddened to learn of the passing in August of longtime San Diego Bonsai Club (SDBC) member Bob Meyer. It was just a couple of weeks before, that we saw Bob at the July meeting. In his over 20 years with the club, Bob was always a very supportive member. He was a former SDBC Board member, and being an attorney, he gave the club legal help often, and was a tremendous advisor in 2000 for the rewrite of the SDBC By-Laws. Bob was instrumental in filing the necessary papers for the SDBC to go from a social type club to its current non-profit educational status. Later he was of invaluable help with the club’s finances. 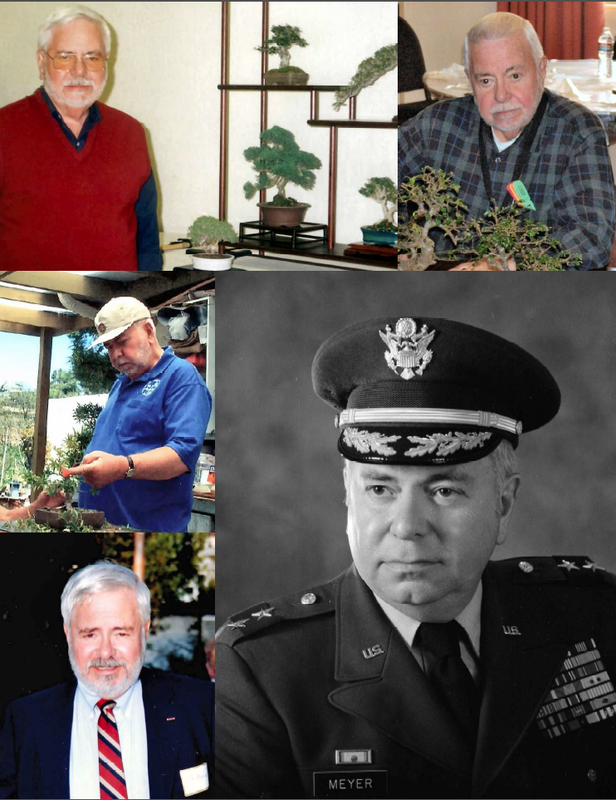 In addition to his activities with the SDBC, he was on the Huntington Golden State Bonsai Federation (GSBF) Board, an advisor to the GSBF, and a representative for several years for the GSBF South Collection. And of course Bob developed his own collection of bonsai. We all had fun times with Bob at the conventions, bus trips, and other social activities. Bob loved the San Diego Opera as a supporter and attendee, he loved to travel, and was active in his church. Major General Meyer had a distinguished career in the U.S. Army National Guard with the Judge Advocate General Corps and as head counsel of Caltrans in Pasadena. Bob culminated his generosity to the GSBF with the purchase of a shohin olive tree, originally propagated and grown by “Big Dave” Rochester, then designed by Bonsai Master Peter Warren at the Burbank GSBF Bonsai Convention last year. Then, in what would be his final gesture to the SDBC, he immediately donated the tree to the Bonsai Pavilion at the Safari Park. Thank you Bob. Bob is in our thoughts, memories, and prayers. Our sympathies to the Meyer Family. A burial service, with full military honors, will take place at Miramar National Cemetery in San Diego on September 29, 2014, at 12:30 PM. In lieu of flowers, please consider a contribution in Bob's memory to a veterans' support organization of your choice.